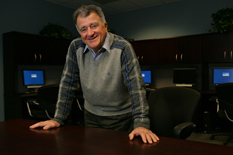 Anthony Ephremides, Cynthia Kim Eminent Professor of Information Technology in Electrical and Computer Engineering and Distinguished University Professor, received the 2012 Ad Hoc and Sensor Networks (AHSN) Technical Recognition Award. The award is bestowed by the IEEE Communication Society and is presented at the annual conference IEEE GLOBECOM. He received the award for his pioneering contributions to Ad Hoc and Sensor Networks. He holds a joint appointment with the Institute for Systems Research, of which he has been a founding member, and has been a member of the faculty at the University of Maryland since 1971. His research interests include all aspects of Communications Systems (Information Theory, Communication Theory, Multi-user Systems, Communication Networks, and Satellite Systems) with focus on Energy Efficiency and Cross-Layer Approaches to Design. He is also interested in Systems Theory, Stochastic Systems, Optimization, Signal Processing, and Wireless Communications.